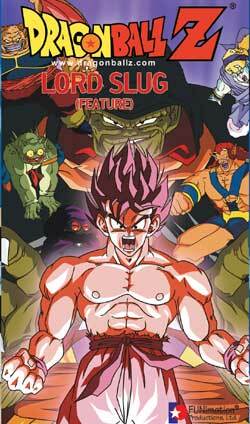 Japanese Title "Super Saiya-jin Son Goku"
This movie starts with Piccolo mediatiating by a waterfall. Gohan shows up with Hiya-Dragon and shows Piccolo that he trained Hiya-Dragon to dance to his whistling. The sound is unbearable to Piccolo's ears. Piccolo screams for Gohan to stop. Dr. Brief and Bulma discover a planet with life on it is on a crash course to hit the planet Earth. Goku and Krillin go to move the planet away from Earth, they destroy the planet, but Slug's ship which was moving the planet lands on Earth. Slug's henchmen step out and tell the people of Earth that Slug will now rule the planet. Gohan, Chi Chi, Bulma, and Oolong happen to be present at the time and Gohan rushes to attack them. Slug notices a Dragon Ball on Gohan's hat through his monitor in his ship. Slug takes the Dragon Ball from Gohan. Slug then read Bulma's mind and takes the Dragon Radar from her and Slug then sends his henchmen to get the other 6 Dragon Balls. Goku turns the tide of the fight against Slug, but his energy as a partial Super Saiy-jin burns out. Slug then reveals himself to be a Namek. Slug also turns out to be a Super Namek. Slug increases his size and once again gains the upper hand in the fight. Piccolo attacks Slug, but Slug grabs Piccolo and tires to crush him. Piccolo rips off his own ears, and screams for Gohan to start whistling. Gohan's whistling paralyzes Slug long enogh for Piccolo to give some of his energy to Goku. Goku uses Kao Kin and goes headfirst through Slug's body. (Just like he did against against Piccolo Daminoh.) Slug survives, but Goku makes a Genki Dama and kills him. Then Goku destroys Slug's ship and the black clouds over the Earth go away. Piccolo then regenerates his ears. Rating: 5/10. This is tied for worst movie along with 11, by some. However I enjoyed this movie since I have the subtitled version. If possible try to get the subtitled version of this movie over Funi's version. Funi's version is ruined because of the music that's in it.